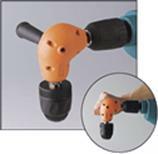 This right angle drill attachment are made of metal gear to extend long life & stability. It contains 3/8" chucks and a 2-3/4" two position side handle. 3/8" RIGHT ANGLE DRILL ATTACHMENT KEYLESS CHUCK Chuck capacity: 1/16" to 3/8"